In the heart of Europe, lies beautiful Slovenia; touching the Alps and bordering the Mediterranean. Slovenia is a hugely varied country with high mountains, grassy lowlands, lush vineyards and carst and coastal regions. Set in western Slovenia, very close to Italy, this trip is a fast-paced short break activity holiday in a relatively unexplored part of Europe. Enjoy the peace, freedom and excitement of Slovenia’s stunning landscape from a mountain bike, a raft or from within a gorge! This extreme programme is a combination of water-based and land-based activities guaranteed to give the maximum adrenaline rush. Previous experience of adrenaline sports is not needed, just good physical fitness and plenty of courage! Enjoy Slovenia’s pristine environment while mountain biking through the alps, rafting down the emerald Soca River and sliding, scrambling and jumping down a water canyon! Our base for the trip is Tolmin, a small picturesque town on the outskirts of the Alps, steeped in history and with a population of around 4000 people. Tolmin is in the centre of the pristine Soca Valley and is ideally located to take advantage of the surrounding Julian Alps and crystal clear rivers, making it the perfect base for outdoor enthusiasts looking to enjoy a selection of land & water activities. The town is also fully equipped with all the services you will need during your stay and it holds markets where you can purchase locally produced goods. Throughout the trip you will be looked after by an experienced team of friendly local guides. Slithering down waterfalls, hiking through a gorge, swimming in crystal-clear pools and much more. Canyoning is all this and more. No experience is necessary to enjoy nature's own water slides. Pršjak is a stream in a gorge where the water level does not vary significantly - there is always enough water and never too much. At the starting-point, you will change into your canyoning gear. Your dry clothes will be waiting for you in the minibus. Once you are dressed and ready, there is a 20-minute walk to the bank of the gorge. This will warm you up and prepare you for the 2-3 hour adventure. The route takes you along a forest trail past the 27m high waterfall that will be your biggest challenge. Before reaching it you can expect a number of other waterfalls between 1 and 12m high. Before you start your unforgettable adventure, the guides will give you a demonstration of safe canyoning techniques. Riding the section between Boka and Trnovo takes you through the most attractive part of the Soca River and lasts about a 1.5 to 2 hours. The trip takes you approximately 12km downriver. The rafting trip is suitable for all swimmers over 15 years of age. During the trip we will lay on a variety of fun and games that will enhance your rafting experience. Venture off with your guide on your mountain bikes, to discover more sides to this stunning region. Wind your way along quiet roads, off-the-beaten track paths and through lush meadows. This is a fantastic region for cycling. If you get too hot you can cool down by taking a dip in the crystal clear river. Night canoeing provides you with a magical evening of relaxation, to introduce you to Slovenia on your first night. Aboard a mini-raft you can take a trip down the lake at Most na Soci. Guides accompany from kayaks. Each raft is equipped with a light, which makes paddling easier. The trip starts at the Volce Bridge and ends at Modrejci. At the destination point your dry clothes will be waiting for, together with a little surprise. For all activities we provide the necessary equipment (For water activities: neoprene suit and shoes, windcheater, helmet and life jacket. For cycling: bikes & helmets), transport, liability insurance, qualified local guides, a drop of good local wine, photos of the trip and more. No previous experience is necessary for any of the activities. The 3 star Pension Kobala is located 2km out from Tolmin in a small, beautiful and peaceful village Poljubinj. It was built in 2006 and offers comfortable lodging in rooms or apartments of various sizes. You will stay here on a half-board basis and eat in the restaurant where excellent home-made specialities are offered. Kind personnel will ensure you have a very pleasant stay. The other option is to stay in family run private apartments which are situated in a nice area of Tolmin town. These apartments are provided on a bed and breakfast basis. Transfer from airport to Tolmin, welcome drink and introductory meeting. After dinner you can optionally go on night canoeing - for the first evening this is an easy activity where you will paddle with the help of head lamps under a million stars and maybe see lightning bursts from summer showers. A magical start to your Slovenian experience! 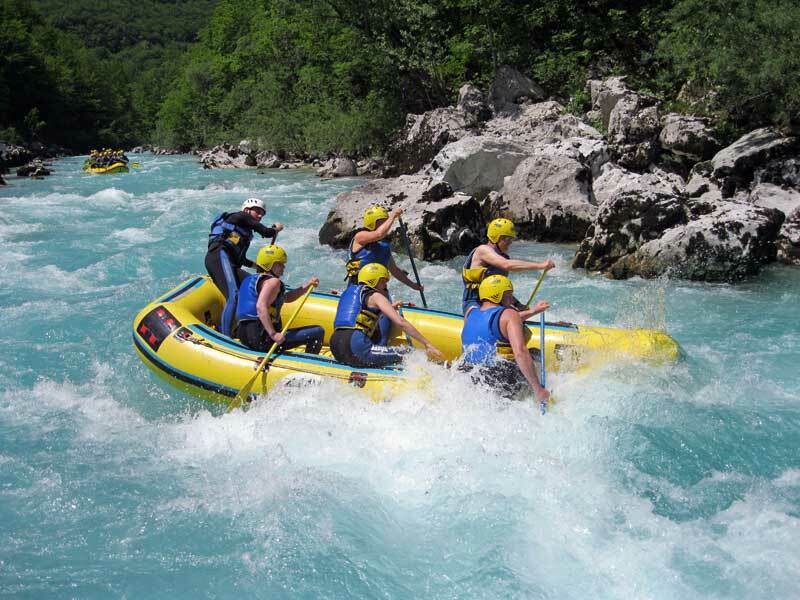 White water rafting on the Soca river on 2-4 rated stretch, surrounded by stunning natural beauty. Fun and technical, meaning everyone's assistance is important when paddling to perform professional 'no touch' run. In the afternoon we set off by bicycle towards the valley of the Idrijca, on a road that winds along above the turquoise Soča, and then continues along the "old" road by the river Idrijca among meadows and pastures. On your final day we have saved the best to last and you are guaranteed a euphoric experience and adrenaline rush whilst canyoning in one of Slovenia's most beautiful gorges. Our excursion starts with a short walk in the picturesque Prsjak gorge where we begin our descent from an elevated position in the forest...sliding and jumping down streams of escalating height, the largest of them a 27m high waterfall, where the assistance of ropework is required. Simply unforgettable! After a late breakfast there will be some time for shopping before departing for the airport. NOTE: only transfers for 4+ people from Trieste and Ljubljana are included free of charge. Extra activities: caving, night canoe etc. A great bunch of people - went absolutely beyond the call of duty and ensured we took back loads of wonderful experiences and memories. Superstars! OUTSTANDING! We have had a really fantastic holiday and the whole Maya team worked really hard to give us a great time. They did all we could ask + MORE. Excellent and exciting fun packed week. The staff went way + beyond what was required to ensure a great holiday. Extremely happy. Everything was absolutely professional and well organised. We had an awesome time on our break in Slovenia! It was brilliant fun and one of the best holidays we've ever been on. We really couldn't have asked for anything more - Slovenia is beautiful, the team who looked after us were all absloutely lovely, the activites were even better than we imagined and the accomodation and food were lovely too. Fantastic holiday. Excellent staff. Simon made our holiday so so memorable and all the other guides. We will be back without a doubt. Q. Are we covered by insurance during the activity? A. Yes. All customers are covered by our own accident insurance during the activities we provide. We would recommend that you take out your own general travel insurance as well to cover you for other aspects of your trip. Q. Can an activity be cancelled and when? A. An activity can be cancelled because of poor weather conditions such as an excessively high water level in the case of water activities or rain in the case of the adrenaline park. Cancellation Policy: if we need to cancel; due to a dangerous water level, we may cancel certain activities and suggest that clients take different activity. If this is not possible, you will get a full refund. Q. Do I need a visa to travel? A. As Slovenia is a member of the EU you will not need a visa to enter if you are a British passport holder. There is a toursit tax to pay but this is often included in your holiday price. Q. Do we need special equipment? A. For water activities, just a swimsuit and a towel; for other activities, gym shoes and comfortable sports clothes. Q. What abilities are we expected to have? A. None of the activities require any previous knowledge or experience. Normal physical and mental health and the ability to swim in the case of water activities are all that is required. We do not accept guests under the influence of alcohol and other psychoactive substances. Our activities are not recommended for pregnant women. Guests with certain pre-existing health conditions (asthma, injuries, etc.) are advised to consult a guide. A. It is important to be aware that all outdoor activities include a certain degree of risk, and this should not be underestimated. We can, however, reduce risk to a minimum, which we do by using highly trained and experienced guides who satisfy all requirements for the individual activities, and by observing safety rules covering every aspect of safety from your arrival at the centre to your happy return. Additionally, only high-quality, fully-tested equipment is used for all activities. A. We know from experience that rain simply makes water activities even more fun! Once you are in the water, you forget about the rain, or rather you start to enjoy it and the unique mist clouds that form just above the surface of the water. People looking to cram in as many activities as possible in a short space of time. All participants must be able to swim. Minimum age limit of 15 to participate in the white water rafting.